“My music relies on a hint of make-believe”, says New York-based musician Oyinda. 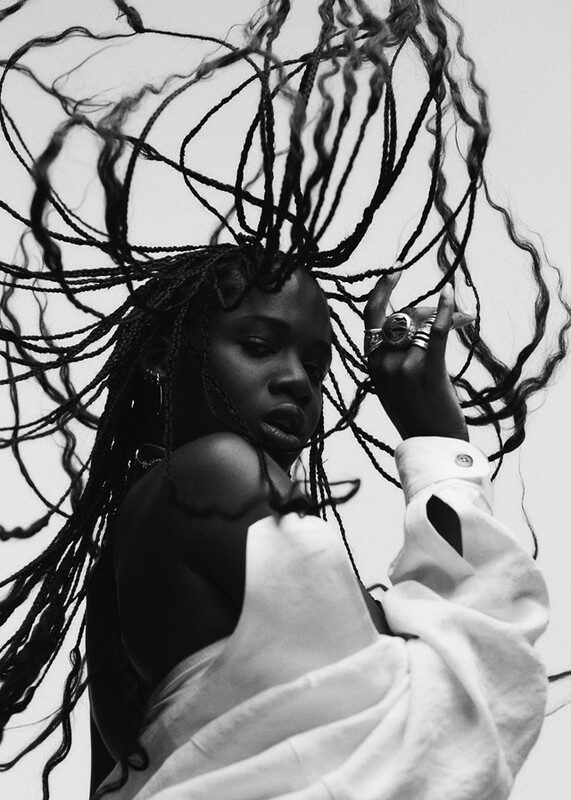 The singer-producer, who grew up in London, makes densely layered R&B that sounds like it comes from a future world – and it’s one entirely of her own making. 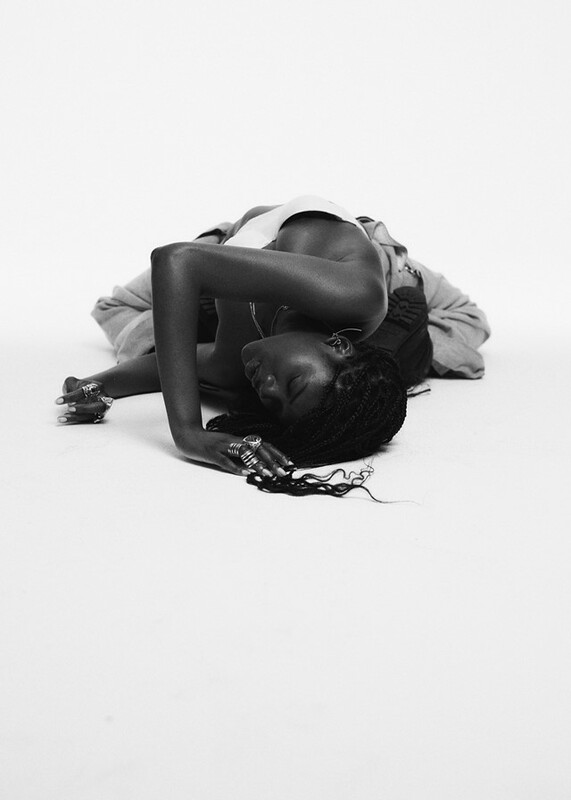 Oyinda writes and produces all of her music herself, as well as directing her own trippy monochrome videos. Just recently, she took the world-building to another level when she released three 360-degree virtual reality videos to accompany remixes of her songs (check out this ice-cold visual for her Empress Of remix). Synths zig-zag back and forth across the surface of Oyinda’s music like lasers, but at its core is traditional R&B and soul. As a child, she was hooked on music from the moment she first heard Whitney Houston – “my first sensei” – burst into song. Today, she takes inspiration from contemporaries like SZA, Moses Sumney, and Nick Hakim, but has created her own metallic, engulfing sound that sets her apart from them all. Earlier this week, she turned heads at Telfar’s AW18 show when she performed with Dev Hynes, Ian Isiah, Kelsey Lu, and more. We caught up with her over email to find out how hypnosis inspired one of her best, most out-there songs, “Serpentine”, and how she befriended Timothée Chalamet at NYFW. Oyinda: I like to think of it as cinematic. I’ve learnt a lot from film scoring, and approach songwriting/producing in a similar way. I love building a mood or setting a tone through my music that hopefully allows listeners to delve into the scene. What was it like growing up in London? Oyinda: A childhood filled with whimsy. I spent most of it in High Wycombe. There’s a lot of green out there; it’s lush, it felt like every meander lead to a secret passageway. It was kind of like living in a shire. I was Bilbo. Well, probably more Smeagol, but a girl can dream. How did you end up living in Brooklyn? Oyinda: The FOMO was too strong. All my closest friends I’ve made live out in Brooklyn, so it was the only way I could continue to be a hermit and spend time with my mates. I live a healthier, homebody life in Brooklyn. Your music videos are incredible. How did you come up with the idea for ‘Serpentine’, and how did you execute it? Oyinda: ‘Serpentine’ stays true to the lyrics of the song. I approach all my videos that way; they don’t have to be a literal representation, so long as they keep the integrity of the story. I was studying hypnosis whilst making the song. There have been instances where patients would wind up referring to themselves in the third person – seeing themselves outside their own sensory systems. When I developed the initial concept for the video, I wanted to expand on that phenomenon, and create a piece with layered transformations like the song. I’ve always planned to use black-and-white and colour as a way to represent my lyrical timeline, so with video I wanted to take that transition further – not just a shift to colour, but a shift in reality. I knew I wanted to push the visuals beyond my own capabilities, so collaborating with (art duo) pussykrew was key. Is it important to present futuristic ideas in your work? Oyinda: I think because I’m a sci-fi nerd, futuristic elements will seep through. It’s not necessarily that I’m consciously trying to present futuristic ideas, but they’re a big part of my imagination. How did you end up performing at Telfar? Oyinda: I’m still baffled by this! I don’t think I know the full story, but I’m pretty sure Dev (Hynes) and Ian (Isiah) had the final say because they arranged the piece. I showed up to Telfar’s studio thinking I was just getting an outfit to wear to his show, but they told me I was actually going to be in it. I was floored. Everyone there was so welcoming and kind it still blows my mind how much genuine goodness they emit. Tell us about your new BFFs Timothée Chalamet and Armie Hammer? Oyinda: Ha! I happened to be at a dinner they were at, and after dessert Aluna (Francis, of AlunaGeorge) and I wanted to get the dance party started. Timothee came thru with a crip walk because ‘Bartier Cardi’ was on, and then Armie came thru when ‘I’m Better’ came on and requested more Missy because apparently he’s a huge fan. I became their ride-or-die then and there. Timothee and I ended up Spotify DJing the rest of the night. Oyinda: Collaborating more. I’m also focusing on a lengthier project at the moment. I think it may shape up to be a mixtape, but only time will tell. I’ve set aside the idea of an EP trilogy for now – I wasn’t in the right space to give it the conclusion it needed. I’m looking forward to whatever this (next project) may be.